MORE THAN A TRIPOD: Octopus Style tripod, it is a versatile mini tripod, adjustable flexible & wrappable tripod legs, which perfectly embodies both maximum flexibility and sturdiness. It's not just an excellent tripod on flat surface, you can also wrap it anywhere you can think of, like lampposts, fence posts, tree limbs, chairs, doorknobs etc. It's a perfect grip when folded as well. 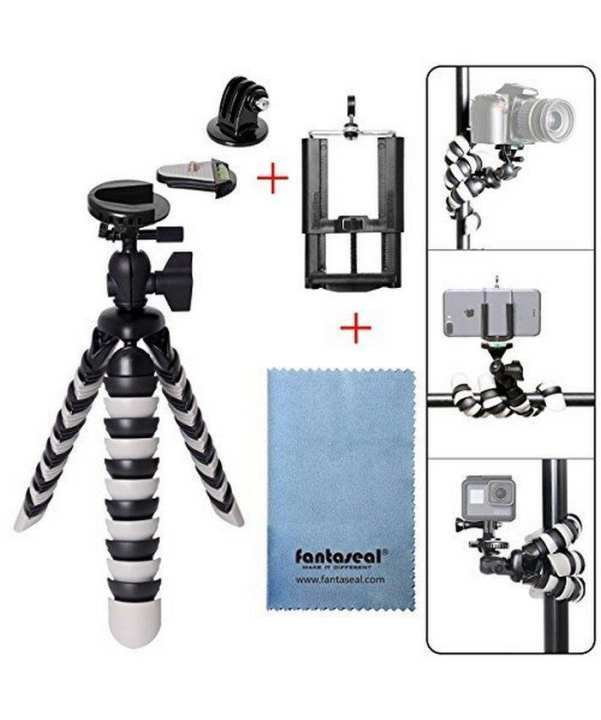 Folded Height : 11"
Our octopus tripod will help you, not only let your hands free completely and keep your shooting equipment safe but also enjoy your activities without anxiety. Octopus Style tripod, it is a versatile mini tripod, adjustable flexible & separable tripod legs, which perfectly embodies both maximum flexibility and sturdiness. It's not just an excellent tripod on flat surface, you can also wrap it anywhere you can think of, like lampposts, fence posts, tree limbs, chairs, doorknobs etc. It's a perfect grip when folded as well. 360 degree rotation ball head ensures 360 degree shooting perspective. Quick Release Plate for DSRL, easy to assemble and remove your camera. Universal 1/4" screw adapter allows a variety of cameras.